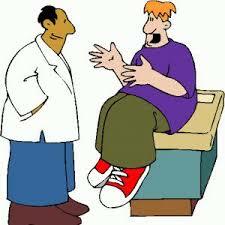 The doctor well aware of the state of the patients mind at that point, took him through the journey of robotic surgery. Robotic Surgery is a surgical procedure (minimal invasive surgery) performed by the doctors with the help of a robot. Doctors utilize robotic arms (tele manipulator) to move the instruments during operation. This has paved the way for remote surgery, which was once unthinkable, now a reality. As the arm movement of a doctor present in any corner of the world can be replicated by the robot performing the actual surgery. Da Vinci® Surgical System is the most popular surgical robotic system made by an American company Intuitive Surgical, and is approved by FDA in 2000. So, robots aren’t new to healthcare, in fact, robots already have a strong footprint in the operating rooms with da Vinci Surgical System by now has conducted more than 20,000 surgeries.. Da Vinci sic has two separate sections, the tower and the console. “Da Vinci” Surgical System consists of two parts: Tower and console. Tower is directly positioned over the patient during surgery. It contains four robotic arms – three of which are for holding a multitude of different surgical instruments, and the fourth one for holding the system’s 3-D cameras. These arms are controlled by a computer that exactly replicates the movements of the operating surgeon. Console is where the surgeon sits and operates the robot’s controls while looking into a stereoscopic monitor that provides a magnified, high definition 3-D view of the surgical site. The surgeon controls the robot’s four arms by moving two master controls that provide fingertip precision of movement. The popularity of robotic assisted surgery is growing day by day as more doctors are using da Vinci® Surgical System due to its added advantage of high definition 3-D vision, greater precision and quick recovery of patients. As it is becoming popular, more companies are coming up with their own version of robots for assisting doctors in surgery. 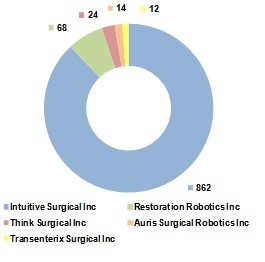 Apart from Intuitive Surgical, other prominent players are Auris Surgical Robotics, Restoration Robotics, THINK Surgical Inc., Transenterix, followed by other upcoming competitors such as Medtech S.A, Titan Medical, Verb Surgical, Medrobotics and Virtual Incision Corporation. If we talk about market share, then undoubtedly Intuitive Surgical has the major chunk in robotic surgery. With the rise in innovation, intellectual property rights are gaining momentum. There has been significant number of patent filings by varied players across countries. Publishing trend in the last 8 years shows a sharp increase in the activity of robotic assisted surgery. But not everything is good in healthcare with these robots, there are instances of injuries or mishaps happened during surgery. Several lawsuits have been filed by patients on Intuitive Surgical, to which Intuitive Surgical is defending by blaming the doctors’ lack of surgical training on da Vinci robot. The most recent case against Intuitive Surgical Inc was by a lady from San Jose, of $300 million accusing the company’s “Da Vinci” robotic surgical system for her severe internal injuries caused while performing hysterectomy. Lots of improvements are needed to make surgeries more precise without causing any injuries because we are dealing with human beings not dummies.